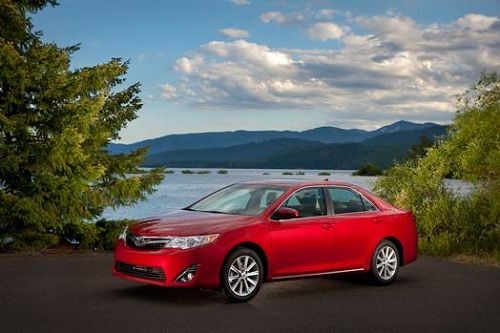 Mid-size cars like the 2014 Toyota Camry have continued to outpace their smaller compact stable-mates such as the 2013 Toyota Corolla. The reasons are many, but here are the top 4 reasons that buyers cannot ignore. All automakers are experiencing incredible sales number increases this past quarter, a trend which started last year about this time. However, the segment that absolutely dominates all of car sales and crossover sales is the mid-size family sedan market. Only pick-up trucks come close to matching the sales volume automakers enjoy with these family cars. There is good reason. In terms of cost, value, fuel economy, and safety they are almost impossible to beat. Here is why America still loves the family car and why shoppers are turning to it in ever increasing numbers. Mid-Size vs Compact Fuel Economy –The Same? To many buyers these numbers look close enough to call equal. The larger Altimas and Accords actually do better than the smaller Corolla for example. In truth the cost of fuel month to month will be very similar for either size car. Before we get too wrapped up in singing the praises of the mid-size sedan, let’s stop and consider something. Is the sales volume being driven by preference, or is the preference being driven by the sales volume? By that we mean are the incredible cost advantages inherent in the huge numbers making these cars too good to pass up? It is possible that plays a big part. We will explore that idea bit more, but it bears considering that when a car maker makes 400,000 of the same car it can do so at a lot lower cost than when it makes 200,000. Momentum may be part of the mid-size market’s magic. Let’s look at three sales leaders in this category, the Toyota Camry, Honda Accord, and Nissan Altima. Every car maker has a great mid-size car, but these are the ones that buyers are picking most often. The Ford Fusion is a close fourth. The Chevy Malibu declined in sales in Q1 and is not a close competitor in either sales volume or fuel economy, and the Hyundai Sonata declined in sales and fuel economy as well. The Camry is on track to sell over 400,000 units this year. By comparison, the next smallest Toyota sedan, the Corolla, is on track for about 20% less overall sales. The Altima is on track for about 350,000 and will only sell about a third of the Sentras which are its smaller car. Finally, the Accord will sell about 350K to 400K cars, and its smaller Civic is close, with about 300,000 likely to sell. This is partly because the Civic is the perennial segment leader. If a shopper compares a similarly equipped Corolla to the Camry they will find that there is not as much difference in price as they would have imagined. If one configures a Corolla vs Camry one step above base the MRSPs are $19,000 vs $ 23,500. However, the lease deals are revealing. Toyota advertises a Corolla for lease at $149 per month for 36 months with $2800 down. The Camry is $189 per month for 36 months with $2900 down. It is fair to say that difference is a budget decision for some, but for others either is a pretty manageable monthly payment. It may actually be lower than their cable bill or cell phone bill in some cases. And the money down is pretty much the same. How come the cars are so close in price? One reason is economies of scale. When Nissan calls tire makers and says “Yes, hello I would like to buy 1.4 million tires please.” That has a big impact. The tire makers are going to do whatever they can to land that order. While the Altima tire order at 460 thousand is still a big order, the larger volume will drive the cost down in the Altima. This is an oversimplified example. However, it is also accurate in that no other industry has been more aggressive in volume cost savings than the auto industry and the volume of a parts order is directly related to the cost coming down. Safety is a pretty big concern for most buyers too. Automakers spend a lot of money to go above and beyond the government and insurance industry expectations – which are considerable. Without a “Five-Star” rating or “Top Pick” status a car will suffer in sales. As time goes on though, buyers are starting to understand what was true all along though – bigger cars are safer than smaller cars. Crash tests are by segment. That means a 5-star rated compact is only as safe as other 5-star compacts. It is not as safe in a crash as a mid-sized car with an equally high rating. In crashes size and overall mass matter. The recent economic downturn allowed the media to write a lot of stories about buyers flocking to smaller vehicles. While smaller cars did see an upswing in sales, mid-size cars did not decline, and in fact rose in sales. As did trucks. A close inspection of the market reveals that the peak value point and the point of diminishing returns on fuel economy converge on the mid-size sedan.